The economy of Illinois is the fifth largest by GDP in the United States and one of the most diversified economies in the world. 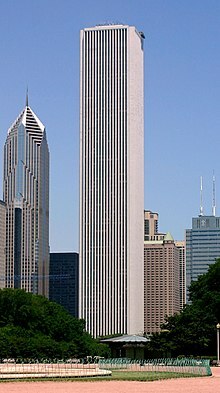 The Chicago metropolitan area is home to many of the United States' largest companies, including Allstate, Boeing, Caterpillar, Kraft Heinz, McDonald's, Motorola, United Airlines, Walgreens, and more. The Chicago area headquarters a wide variety of financial institutions, and is home to the largest futures exchange in the world, the Chicago Mercantile Exchange. The 2018 total gross state product for Illinois was $857 billion, placing it fifth in the nation. The 2015 median household income was $59,588. In 2016, the nine counties of the Chicago metropolitan area accounted for 77.3% of the state's total wages, with the remaining 93 counties at 22.7%. The state's industrial outputs include machinery, food processing, electrical equipment, chemical products, publishing, fabricated metal products and transportation equipment. Corn and soybeans are important agricultural products. Service industries of note are financial trading, higher education, logistics, and medicine. Manufacturing in Illinois accounts for 14% of the state's total output and generates $101 billion in economic activity. Illinois's manufacturing sector grew out of its agricultural production. A key piece of infrastructure for several generations was the Union Stock Yards of Chicago, which from 1865 until 1971 penned and slaughtered millions of cattle and hogs into standardized cuts of beef and pork. By the early 2000s, Illinois's economy had moved toward a dependence on high-value-added services such as financial trading, higher education, logistics, and medicine. In some cases, these services clustered around institutions that hearkened back to Illinois's earlier economies. For example, the Chicago Mercantile Exchange, a trading exchange for global derivatives, had begun its life as an agricultural futures market. The Institute of Government and Public Affairs at the University of Illinois at Urbana–Champaign publishes a "flash-index" that aims to measure expected economic growth in Illinois. The indicators used are corporate earnings, consumer spending and personal income. These indicators are measured through tax receipts, adjusted for inflation. 100 is the base, so a number above 100 represents growth in the Illinois economy, and a number below 100 represents a shrinking economy. Data from the index, from 6/1981 to the present, can be found here. ^ "Total Gross Domestic Product for Illinois". stlouisfed.org. 11 May 2017. Retrieved 1 April 2018. ^ "Per Capita Personal Income in Illinois". stlouisfed.org. 22 March 2018. Retrieved 1 April 2018. ^ Bureau, U.S. Census. "American FactFinder - Search". factfinder.census.gov. Retrieved 1 April 2018. ^ Elejalde-Ruiz, Alexia. "Illinois' unemployment rate rises to 6.6 percent in April". chicagotribune.com. Retrieved 1 April 2018. ^ "Chicago Economy". World Business Chicago. Retrieved 26 January 2019. ^ "Illinois State Household Income - Department of Numbers". www.deptofnumbers.com. Retrieved 1 April 2018. ^ Bieneman, Dave (September 2016). "2016 Illinois Economic Report" (PDF). Illinois Economic Report: 1–98. Retrieved 2 April 2018. ^ "Facts About Illinois Agriculture". www2.illinois.gov. Retrieved 26 January 2019. ^ "Matter of taste: Area in southern Illinois gets Shawnee Hills designation". Springfield, Ill. State Journal-Register. 2006-12-14. p. 21. ^ "Illinois Manufacturing Facts". National Association of Manufacturers. Retrieved 26 January 2019. ^ a b c Illinois: A Descriptive and Historical Guide. US History Publishers. 1939. p. 84. ISBN 9781603540124. ^ "Illinois Manufacturers Organize: They Will Protect Their Interests in the Female Labor Law". Chicago Daily Tribune. September 30, 1893. ^ Sklar, Kathryn Kish (1995). Florence Kelley and the Nation's Work: The Rise of Women's Political Culture, 1830-1900. New Haven: Yale University Press. pp. 254–255. ISBN 9780300072853. ^ Mayer, Levy (1913). Opinions rendered to the Illinois Manufacturers' Association from January 1, 1899, to January 1, 1907. Chicago, Ill.: Illinois Manufacturers' Association. p. 42. ^ "Renewable Energy". Illinois Environmental Council. Retrieved 26 January 2019. ^ "Midwest common sense will drive clean energy shift, despite D.C." Crain's Chicago Business. 8 February 2017. Retrieved 26 January 2019. ^ Briscoe, Tony. "Gov. J.B. Pritzker commits Illinois to climate change fight as study shows extreme weather convincing more people". chicagotribune.com. Retrieved 26 January 2019. ^ "The conundrum of Chicago's economy". Crain's Chicago Business. 3 March 2016. Retrieved 26 January 2019.